CO2 is an important compound for plant and animal life, as part of the carbon cycle, and as a greenhouse gas (GHG). CO2 is the primary GHG emitted in California, accounting for 83% of total GHG emissions in 2016. Transportation is the single largest source of CO2 in California; which is primarily comprised of on-road travel. 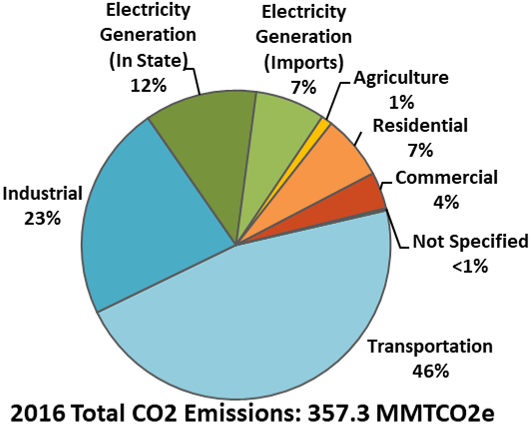 Electricity production, industrial and residential sources also make important contributions to CO2 emissions in California. Help reduce your carbon dioxide emissions by driving less, switching to a more fuel efficient vehicle, and saving electricity at home and at work! Explore GHG emissions by source with our interactive treemap plots.